Initial European settlement at Killisnoo appears to have been the establishment of a Hudson Bay Company station (Moser 1899). The Killisnoo plant was established by the Northwest Trading Company, an ambitious firm from Portland Oregon which sought to establish a foothold in the newly purchased (1867) and rapidly developing Alaska Territory. The NWT began operations at Killisnoo as a trading post in 1878 (U.S. Dept. of Interior 1893). The operation was clearly well financed, constructing shore plants, purchasing vessels and barges, and moving men and equipment around Southeast Alaska with ease, very quickly after the start of its operations. The steamer Favorite was purchased and in 1880 set out for Southeast Alaska under the command of J.W. Keene to support operations there. By the spring of 1881, the new company had established trading posts at Howkan, Killisnoo, Sitka, and Juneau. The enterprise was begun in an experimental way in 1879 by the Northwest Trading Company. The company had established a trading station at Killisnoo in 1878. It was observed that a large number of finback whales frequented the waters of that vicinity to feed on the herring and in 1880 whaling was attempted but was discontinued the same year. The oil and fertilizer business having been found a profitable one it was gradually increased until in 1887 the maximum production of 380,000 gallons of oil was reached. This station represents an investment of over $100,000; the oil works alone having cost $70,000, and extravagant management having doubled all the necessary expenses of the first plant. As there was no water supply on the solid rock of Kenasnow, a reservoir with a storage capacity of 90,000 gallons of water was constructed; and with cedar forests on every side every bit of lumber used was brought by freight from below. On this little island of Kenasnow, the Northwest Trading Company has its largest station, Killisnoo, where codfish are dried, herring and dogfish converted into oil, and the air weighted with the most horrible smells from the fish guano manufactured there. The company has extensive warehouses, works, and shops on Kenasnow, and around the buildings there are gathered quite a village of Kootznahoo Indians who are employed at the fishery. Killisnoo was first established as a whaling station but many causes decided the company to abandon that branch of fishery. There is a tradition that the Indians once regarded their great totemic beast, the whale, with such veneration that they would never kill it, nor eat of its flesh and blubber. The Kootznahoos have grown skeptical in many ways, and they made no objections to harpooning the whale, until the bomb exploded in 1882; and after the troubles following upon that impious adventure, the company decided that whaling was not a profitable business, and began to fish for cod and smaller fry. Scidmore 1885 implies here that the harpoon explosion, and the subsequent melee of the bombardment, had much to do with the switch from whales to herring. She would have heard this tale either 9 months or 21 months after the incident, which must have still been fresh on the minds of those she apparently spoke to. Whales appear to have remained abundant in the Chatham Strait area, because they attracted additional shore-based whaling effort two decades later at Murder Cove, and at Port Armstrong, both of which would subsequently be associated with herring reduction plants. ...the Northwest Trading Company of Portland Oregon appears to have engaged in shore whaling from its post on Killisnoo Island in Chatham Strait about 1880. 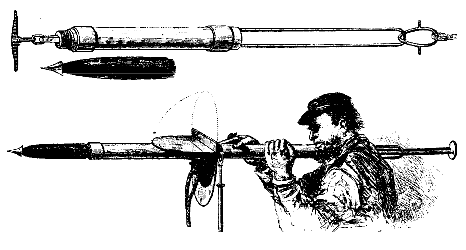 The operation enjoyed very little success; a bomb gun explosion -- perhaps it was a California Whaling Rocket --(cached) -- killed two (sic) men, and after a few years the company abandoned whaling in favor of the herring fishery. About the California Whaling Rocket, the current (3/28/08) Wikipedia version of the History of Whaling records that: "In 1880, Thomas P. H. Whitelaw fitted out the forty-four-ton steamer Daisy Whitelaw of San Francisco. With the California Whaling Rocket she "very successfully" hunted fin whales though the Farallon Islands to Drake's Bay. That same year, some of the rockets were purchased by the Northwest Whaling Company, or Northwest Trading Company, of Killisnoo Island, on the west coast of Admiralty Island, Southeast Alaska. They hunted fins and humpbacks, firing rockets from the deck of the company's small steamer Favorite, as well as from whaleboats. They established a whaling and trading station on Killisnoo Island, giving a few jobs at the whale processing plant to both Killisnoo and Angoon residents. After a few years of whaling, the station was turned into a herring processing plant, going out of business in 1885." (source uncertain -- bibliography includes Webb 1988--note - the plant continued operating until 1928 under different ownership after 1885-FF). Killisnoo was first established as a whaling station, but after difficulties with the natives the catch was changed to herrings, which are much more easily secured and managed. Figure __. 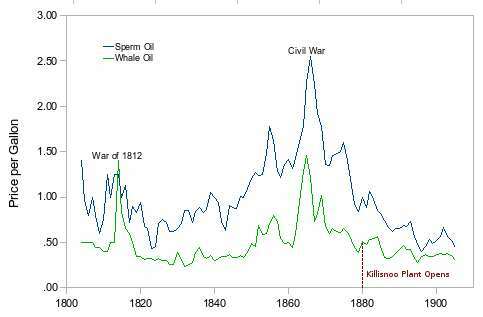 Price of sperm and (other) whale oil, 1804-1905. Data extracted from Starbuck (1878) for 1804-1843 (p. 660), and from 1843-1905 from the "Whaleman's Shipping List", as cited in Tower (1907). For an inflation-corrected interpretation of the 1804-1878 portion of these data and a Huppert Cycle analysis, see Bardi (2004). It was likely that declining whale oil prices contributed to the decision to switch from processing whale oil to herring oil. Whale oil prices had spiked during the civil war but were falling rapidly (Figure ___) as the Killisnoo plant began operation. The price of whale oil continued to fall as oil consumers switched to less expensive petroleum-based products. The last application for whale oil in the U.S. was for high-quality, non-congealing lubricant, with distribution finally ending in 1978 when sources were no longer available. Entering the whaling industry was a risky proposition well before 1880 -- the U.S. whaling fleet had already declined from 735 vessels in 1846 to only 39 vessels by 1876. On the east coast of the U.S. in the 1870s there was continued interest in producing oils, even though the prices were declining; menhaden oil (produced in a reduction process similar to that for herring) was "interchangeable" with whale oil (Webb 2001, Reeves et al. 2002). When menhaden abundance declined sharply in the Gulf of Maine in the late 1870s, some fishermen, and their steamers, converted to whaling; when menhaden reappeared in the Gulf of Maine in 1886 "steamer whaling lost its appeal and most of the steamers returned to fulltime (menhaden) fishing" (Reeves et al. 2002). Scidmore (1885) notes that the Killisnoo plant managers (likely Vanderbilt and DeGroff, who were both born on Staten Island) were experienced in reduction processing of menhaden. Here we have a close correlation between east and west coasts in the pattern of activity during the initial years of the Killisnoo plant. The fact that in 1880 many of the New England menhaden plants had closed because of low menhaden abundance (Johnson et al. 1915) could well have prompted the Northwest Trading Company to investigate replacement oils, both whale and then herring. Caution: These pages contain preliminary research results, and are presented here only to further collaborative research and analysis. The information presented has not been fully analyzed or verified for correctness. Please consult the original literature citations for authentic interpretations or contact the author regarding applications of any analysis presented on these pages.